Many of us gain weight when we are stressed simply because we grab a quick fix of carbs to keep us going. Over the course of days and weeks this often adds up quickly to quite a few kilos. We know what we should be eating, but often we are just too tired or too busy to prepare healthy meals and snacks. But for some people stress adds another nasty surprise with elevated cortisol resulting in weight gain around the stomach. If you usually put it on around the hips something else may be contributing. Cortisol levels should be highest in the morning and fall during the day, being lowest at midnight. Typically if your cortisol is high you may also have problems sleeping as well. Cortisol has a wide range of functions but for weight gain it stimulates the release of glucose to maintain blood sugar levels. 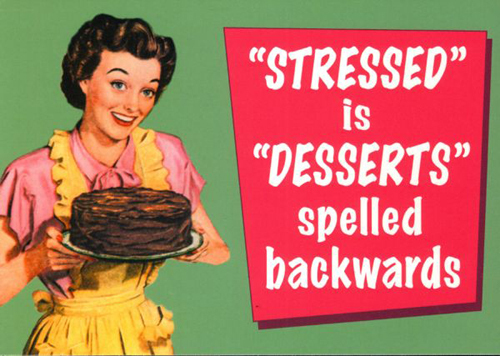 So elevated cortisol through the day can result in increased appetite – stress is making you hungrier (and fatter). Getting control of your cortisol levels isn’t as simple as just balancing blood sugar. You need to deal with triggers which are creating the stress for you. Sometimes it isn’t the situation itself but how you respond to it that makes you stressed. Often what is stressful for one person is not a problem for someone else. So once you identify the trigger try and think about some other ways to handle the situation. Take five deep breaths before you even think about reacting. If you still aren’t feeling calmer then a thirty minute walk (before you scream at your boss) which will reduce your cortisol levels and help you stay calmer. A regular meditative practice, such as yoga or indeed meditation can also be a good way to get your cortisol levels under control.